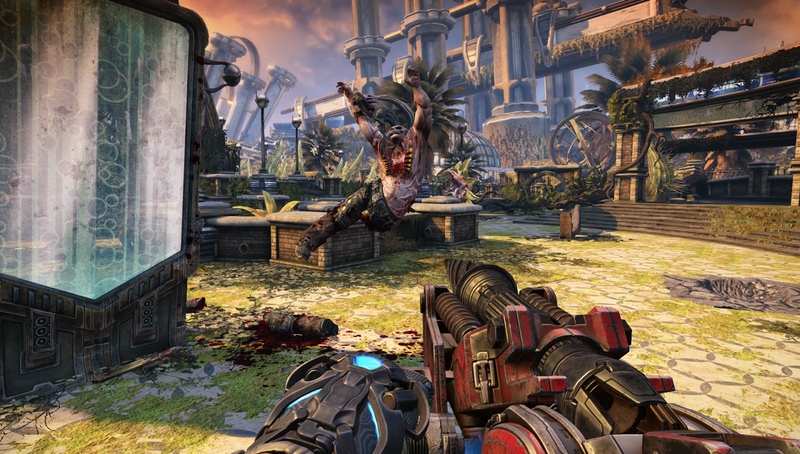 Bulletstorm for the Xbox 360 was a game I bought thanks to it having a Gears beta code offer attached to it at launch. Sure the trailers looked semi-decent at the time, but I was just there for Gears and nothing else. When I finally had the game in hand and got to play it however, I found a game that was not only fun to play, but it also offered something very different to what was available at that time when it came to shooters. Was it that good that it deserves a remaster and re-release six years later? That's something up for debate. 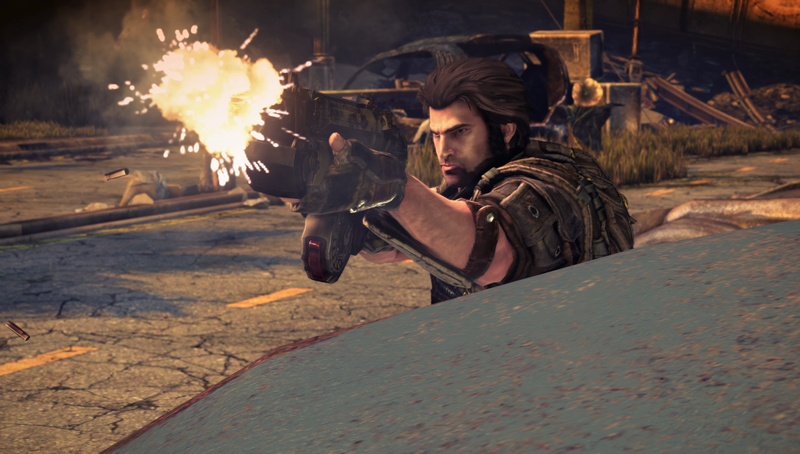 Bulletstorm sees you playing the role of Grayson Hunt, the leader of a group called Dead Echo who are nothing more than paid assassins on the payroll of a man known as General Sarrano. After a mission in which they kill a reporter by the name of Bryce Novak, they find out the general has been lying to them all along about who these targets were, with Grayson and team thinking they were taking out high-end targets when actually the people they have killed are nothing more than reporters and civilians who have information on the General. Years later and now rogue, Grayson and team come across the spaceship that has the General on it and attack, with the outcome being that both ships end up crash landing on a planet called Stygia. The game then sees you having to do a number of things throughout seven chapters, but the main goal being to get the hell of this planet and wipe out everything on it. Doing these skill kills also play a key role in you character progression as you work through it, with new weapons and things unlocking along the way. While starting out with the basic machine gun early on, you're soon unlocking a sniper, a pistol, a shotgun and so on. They don't have boring names like that mind you, as where would the fun in that be. In Bulletstorm they have cool sounding names like Boneduster and Penetrator, with each weapon allowing you to unlock something called a charge in each one of them. Buy one of these (you can also upgrade these too to allow more charges and ammo capacity with points you earn) and press RB and this bullet will do something a little bit special. Take the Sniper/Head Hunter charge for instance. Have a charge shot in this and it allows you to shoot your bullet and detonate it before impact, making it possible to clear out a few enemies with it rather than just the one. Even the leash has a charge option, with this one being called the thumper and will send all enemies close by flying into the air in slow motion, making it a great thing to have when you're bogged down with attackers.You get seven weapons in total (not counting the leash) by the end of the game, so if you're not having fun by then you need someone to check your body for a pulse. With the game being a remaster, you always expect it to look better than it did previously now it's being showcased on a more powerful machine, but to be honest my memory never had the original game looking that bad when thinking back. You can see the image above of the world the game takes place in ticks all the right boxes when it comes to looks at least, with certain levels once again being a joy to play, and remind me how much fun the game was. The game isn't perfect mind you, with the two most notable things being slow down numerous times when a lot was going on with enemies and so on, to even the game freezing around five times on my full story playthrough. This doesn't take anything away from my time with single player being an enjoyable experience, so take these issues as me just making you aware of my experiences as you might not even see these. The place where my excitement for Bulletstorm starts to take a dip is for the online side of the game and also just replay value for the single-player. If you're not a leaderboard guy there is no real reason to return to SP once the few collectables on offer have been completed, and even more so when the Echo mode portion of the game uses bite-sized portions of the levels in them. Because of this the campaign is very much a one and done experience, with mopping up anything you've missed being the only reason to jump back into it. Echoes like I said, are portions of levels in which your goal is simply to score as much as you can with kills with skills, which is fun the first few times but is soon a mode that you forget all about. Ultimate Echoes are the same, only this time it throws in certain challenges too. Both modes are very easily forgotten about soon after playing them. So don't expect to play these for hours upon hours if leaderboards are not your thing. Online Anarchy is the mode where you actually play online with other people or friends in a horde like mode in which you try to stay alive and work your way through rounds while scoring a set amount to pass through that level. Much like the Echoes this is fun the first few times of playing. Soon enough though you just put them to the side and forget all about them. You can also unlock Overkill mode by beating campaign which is a great way of getting all those kills in the skillshot database if that's something you would enjoy doing. This mode lets you play through any chapter of the campaign again only this time it gives you all the guns available at all times, and by getting all the skillshots with that gun you will also unlock unlimited ammo for it aswell. (TO BE ADDED THIS WEEKEND) I will be adding a few words here on the Duke Nukem portion of the game that is available when pre-ordering once it becomes available. I've heard if you miss out on this with a pre-order you will still be able to buy it by itself after launch. What I do know is it that is allows you to play through the campaign as Duke himself, with re-recorded lines and even new lines from Duke now being part of the game. Overall: I really enjoyed coming back to Bulletstorm and being reminded how fun a shooter can be. It certainly still offers something very unique and not something that's been done to death in other shooters, but is let down with both replay value and wanting to comeback to it once the campaign is fully complete. Online modes are a bit boring and bland.